Ninjas hate fruit. I am Japanese, so trust me on this. It is common knowledge that all the major ninja clans have been avowed fruit-haters for generations. The only things ninjas hate more than fruit are robots and giant monsters, and that’s only because they keep stomping all over Tokyo. If you ever want to seriously anger a ninja, throw a kiwi at him. Fruit Ninja is a very simple, but insanely addictive game where you slash at randomly tossed up fruit with a samurai sword. Don’t miss too many fruits and don’t hit a bomb or else it’s game over. That’s it. There are no additional challenges or hidden levels to unlock, just the rush of the high score to chase. It sounds a little stupid and simple, and it is, but believe me when I say it’s a lot more fun than you’d think. The graphics are great, very bright and engaging, and there is a wonderful visual splat every time you successfully eviscerate a mango or kiwi. Every swipe of your finger comes with the delightful swoosh of a razor sharp blade making fruit salad of everything in sight, and the game controls work perfectly. It’s really satisfying to slice through multiple fruits in one controlled swipe, but at one point I got a little carried away and had a blast trying to slice the screen as many times as I could. You can’t actually slice a fruit more than once, which I found a little disappointing, but it didn’t really matter too much during my frenzied slice and dice-fest. It didn’t last long thanks to a couple of bombs, but I still had a grand time. It starts out easy, but very quickly gets harder, and I definitely played this one over and over again, always chasing after a higher score. The game is OpenFeint enabled, so you can also compare your score to others and challenge your friends to a mango massacre, if you desire. Eventually my boyfriend and I were fighting over the iPhone for the chance to play, which I took as a sign of the game’s wide and gripping appeal. It’s not a super-involved game, but once you start playing it, you won’t be able to put it down, and for less than a dollar, Fruit Ninja definitely stands out as a cut above the rest. 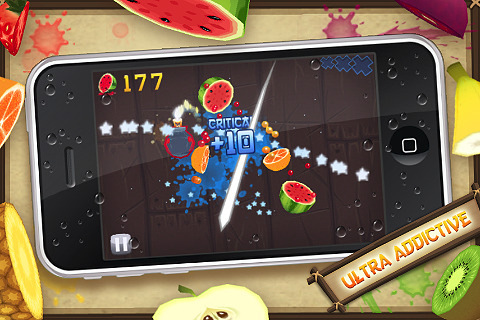 AppSafari review of Fruit Ninja was written by Tracy Yonemoto on May 9th, 2010 and categorized under Action, App Store, Featured, Fun, Games. Page viewed 6640 times, 1 so far today. Need help on using these apps? Please read the Help Page. this was one of the first apps i downloaded, actually for my 9 year old to entertain him when we were waiting at appointments, etc. Not only did he love fruit ninja, i am totally addicted to the game as well. It’s fast, fun, good graphics and has some very funny and informative facts on it. My teenager even likes to play it. Highly recommend!!! !